Our Puritan work ethic dictates that we have to strive to overcome our weaknesses, face our deficits head on, take the bull by the horns. Well, that’s bull. If you can stay away from the things that don’t bring you joy and excitement, that aren’t of interest to you, you free yourself to use your strengths. If you’re not a numbers person, you shouldn’t be an accountant. If you can’t play guitar, forget being a rock star. If you aren’t good at basketball, don’t dream of your day in the NBA. RMITs divest themselves of the things they don’t naturally excel at, enjoy, or find emotionally and intellectually stimulating. They seek more pleasure, less pain. 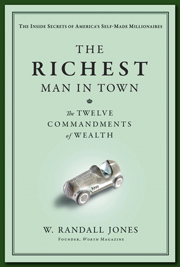 It was Jonathan Nelson, the richest man in Providence, Rhode Island, who gave me the perfect phrase for the second commandment in The Richest Man in Town. We’ve all heard the advice, “Know thyself.” Nelson, like many of the RMITs I interviewed, took that very wise advice to the next level. He learned the importance of the second commandment in school—in a course on Beethoven at Brown University—but this lesson was not on the syllabus.